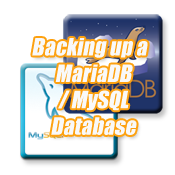 In the control panel, within Backup section, under Download a SQL Database Backup will be your MariaDB / MySQL databases that you can download. In a few cases a database will not restore properly after you download it. This is an issue with phpMyAdmin so you make want to make sure you have data backed up or exported in another way to be secure.